Indian President APJ Abdul Kalam (left) addresses students and faculty, including UCSD computer scientist Rajesh Gupta (on video monitor at left) in Coimbatore. New Delhi, India and San Diego, CA, December 20, 2005 -- The Government of India and universities from the United States and India have inaugurated an ambitious E-learning collaboration to enhance science and engineering education at Indian universities and to boost the supply of world-class engineers available for corporate and academic research in both countries. 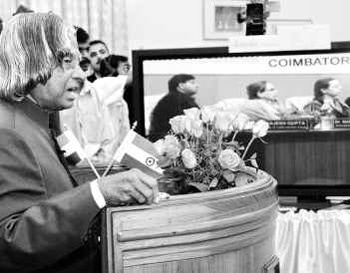 The President of India, Dr. APJ Abdul Kalam, participated in the network’s launch this month, giving the inaugural lecture via satellite from New Delhi to students at a dozen far-flung Indian college campuses. The interactive seminar – on India’s research challenges – came one day after nearly two dozen U.S. universities joined with several Indian institutions in the Indo-U.S. Inter-University Collaborative Network in Higher Education and Research. Indian Secretary of Science and Technology V.S. 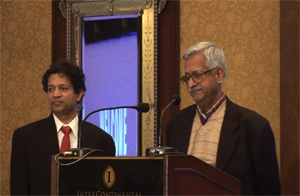 Ramamurthy (right) and Amrita University Vice Chancellor Venkat Rangan brief media on the Indo-U.S. university network. If we start today it takes ten years to train a good quality teacher, but we need to improve Indian education now,” said V.S. Ramamurthy, Secretary of India’s Department of Science and Technology, which is co-sponsoring the initiative with the Indian Space Research Organization (ISRO). “We are very happy that leading institutions from the United States see the benefit in this collaboration, because if you bring in a certain uniformity of training across the globe, it helps everyone. “Many of us in higher education depend critically for research and innovation on bright young minds,” said Ramesh Rao, director of the University of California, San Diego (UCSD) division of the California Institute for Telecommunications and Information Technology (Calit2). “It behooves us to reach out proactively and nurture this talent pool.” Rao led a Calit2 delegation attending the inaugural ceremonies, including Jacobs School of Engineering Dean Frieder Seible and professors Rajesh Gupta, Mohan Paturi and Mohan Trivedi. UCSD Division Director Ramesh Rao (right) and Calit2 special projects manager Jerry Sheehan were part of the Calit2 delegation visiting India in December. Boosting engineering education in India – especially at second- and third-tier universities – would groom a more tech-savvy workforce for American R&D operations in India and around the world, so three U.S.-based companies have already committed funding to the program. QUALCOMM, Microsoft and Cadence Design Systems will pay for U.S. professors who volunteer to spend part of their sabbaticals teaching at the E-learning facility in Coimbatore of Mata Amritanandamayi Center’s Amrita University, the founding Indian university in the network. Their lectures will initially be beamed to Amrita’s three other campuses (in Amritapuri, Bangalore, and Kochi) and other universities over Edusat, the country’s first satellite devoted exclusively to educational programming. Organizers hope the lectures will eventually reach classrooms on 100 campuses across India, but the initial rollout involves 15 universities, including the three Indian Institutes of Technology (in Kanpur, Chennai and Mumbai) and most of the second-tier National Institutes of Technology located in each Indian state. The UC/Calit2 delegation included (l-r) Calit2 staffer Jerry Sheehan; UC international programs head Gretchen Kalonji; Jacobs School professor Mohan Trivedi; dean Frieder Seible; professor Rajesh Gupta; and Calit2 division director Ramesh Rao. Many of those universities have been unable to attract or retain world-class faculty, and therefore are limited in their ability to turn out candidates for top jobs in engineering, computer science, biotechnology and other fields. The original memorandum of understanding was signed last July in Washington, D.C. during Indian Prime Minister Manmohan Singh’s state visit to the United States. Initial signatories included the University of California Office of the President, UCSD, UC Berkeley, Calit2 and its sister institute CITRIS, as well as Cornell, Carnegie Mellon, Case Western, and the State University of New York at Buffalo. Indian and U.S. participants on hand for the launch in New Delhi of the education and research collaboration. In December, 15 more American universities joined the initiative, including Harvard, Princeton and Yale, most of which were represented at the formal launch in New Delhi. Other U.S. university partners include Purdue, Georgia Tech, University of Massachusetts-Amherst, University of Washington, University of Texas-Austin, University of Wisconsin-Madison, University of North Dakota, University of Maryland, University of Michigan, University of Illinois at Urbana-Champaign, as well as UCLA and UC Santa Cruz. “Since we are a research engineering school, I cannot imagine teaching without research,” said Frieder Seible, dean of UCSD’s Jacobs School of Engineering. “It’s too early to announce specific research projects, but there are certainly areas where it is natural to work with India.” Seible cited his own field of structural engineering, including infrastructure sensors and sensor networks to mitigate man-made and natural disasters, as well as the entire IT-driven area. 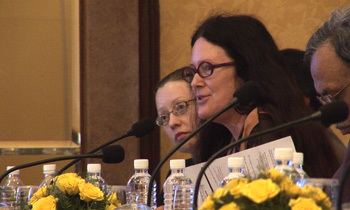 UC Director of International Strategy Development Gretchen Kalonji explains UC's international ambitions to Indian media and university officials. “There was a strong sentiment that we cannot do teaching without having a concurrent research component, so this was a refinement of the earlier engagement,” added UCSD computer science and engineering professor Rajesh Gupta, who will chair one of four standing committees of Indo-U.S. scientists. “We boiled it down to four separate groups, including the one I’m leading on embedded systems, where we identified focus areas, including automotive software, automotive embedded systems and nanotechnology.” The other standing committees will explore research collaboration on disaster warning and management technologies, IT services, among other areas. The launch of the Indo-U.S. network, in part funded by Microsoft, coincided with a visit by the company's chairman and founder Bill Gates to India, where he announced plans to invest $1.7 billion over the next three to four years. Microsoft sees improved engineering education as essential to its plan to increase its Indian workforce from 4,000 to 7,000 – including many engineers for its R&D facility in Bangalore. 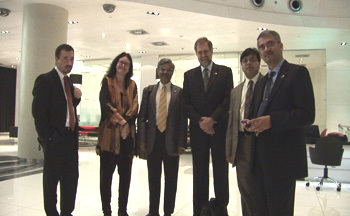 UC officials, led by Calit2’s Rao and UC Director of International Strategy Development Gretchen Kalonji, also held discussions on possible funding of joint research projects by India’s Technology Information Forecasting and Assessment Council (TIFAC), whose charter is to promote industry-university collaborative research. “India is a strategic partner for the future of the 10-campus UC system,” said Kalonji, who toured all four Amrita campuses in southern India, “and the distance-learning platform is a powerful one.” TIFAC may also fund top Indian graduate students on 18-month research fellowships on UC campuses. U.S. universities clearly believe that helping to improve engineering education in India could result in more Indian candidates choosing U.S. campuses to do their Ph.D. “Many of our best students are from India, and we look forward to inviting more students from India to our College of Engineering,” said Rosalyn Pertzborn, director of University of Wisconsin-Madison’s Office of Space Education. 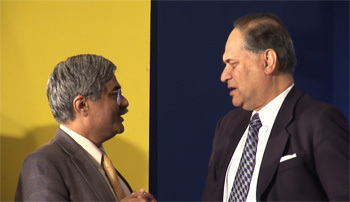 University officials hope to raise further private funding for the initiative from corporations in the U.S. and India. On May 31, 2006, Calit2 and UCSD’s Jacobs School will host a one-day Indo-U.S. Summit on Education, Science and Technology for Society in San Diego.